Dockless Scooters Gain Popularity And Scorn Across The U.S. Those who enjoy riding them may constitute a silent majority. Dockless scooters and bikes have drawn the ire of some who say they're a nuisance. A Bird scooter sits parked on a street corner in San Francisco. Dockless scooters have become very popular across the U.S., but many people say they're a nuisance. A survey of 7,000 people by the research firm Populous found that 3.6 percent of people reported using scooters in the relatively short time they've been available, which is a quicker adoption rate than competitors such as dockless bikes. Nearly 70 percent of people view dockless scooters positively, the report also found. "The adoption of these new services has been quite remarkable in terms of how quickly people have started using them, and in fact, overall adoption of new mobility services is accelerating," Populous CEO Regina Clewlow tells Here & Now's Peter O'Dowd. Many of those surveyed view dockless scooters as a fun and easy way to get around the city, Clewlow says. According to the report, riders say dockless scooters complement public transportation and can replace short rides in a personal car, Uber or Lyft. They can also support a car-free lifestyle. And they're cheap to ride, too. They cost about $1 to unlock and then 15 cents per minute. Users download an app, enter their credit card information and locate available scooters in their area. "Because so many people are accustomed to using their cellphones to call an Uber or Lyft or now unlock a car-sharing vehicle, the idea of being able to unlock a dockless electric scooter feels quite natural," Clewlow says. But those who enjoy riding these scooters may constitute a silent majority. In fact, dockless scooters and bikes have drawn the ire of some residents who say they're a nuisance. People weave in and out of traffic at speeds of up to 15 mph, often without helmets, and when they're done riding, they discard the scooters in the middle of sidewalks, according to reports. Paul Christian, an Uber driver in Austin, told Here & Now's Jeremy Hobson that he often has to dodge reckless riders. "They're kind of cool, I guess," he says of the scooters. "But at the same time, I see a lot of people doing some unsafe driving habits when they're on those scooters like going the wrong way on one-way streets, running through stop signs, red lights, and I'm just kind of worried that someone might have an accident." The scooters have made people so angry that some have taken matters into their own hands. In Los Angeles, scooters have been vandalized, set on fire and tossed into public toilets. The Instagram account ScootersBehavingBadly documents the all-out war against dockless scooters in some cities. Local governments are also struggling to keep up. In San Francisco, St. Louis and Milwaukee, among other cities, electric scooter companies deployed hundreds of scooters unannounced or without permission from the city. Some cities have completely banned scooters by issuing cease-and-desist orders. In June, San Francisco ordered electric scooter companies to stop operations until they applied for permits. The same thing happened in Cambridge and Somerville, Mass., just days after scooters were dropped on the streets. Patrick Sisson, a reporter with the website Curbed, told NPR's All Things Considered that the confusion over how to regulate dockless scooters is similar to how local governments reacted to the rise of Uber's and Lyft's ride-sharing services. City officials are completely caught off guard and unprepared. "It sort of follows the same blueprint we saw with Uber and Lyft, where tech companies are looking to provide transportation mobility solutions," Sisson says. "But they're asking for forgiveness after the fact instead of permission before the fact." But Clewlow says dockless vehicles will be easier to regulate because they are smaller than cars and "you can impound them and collect them much more easily." 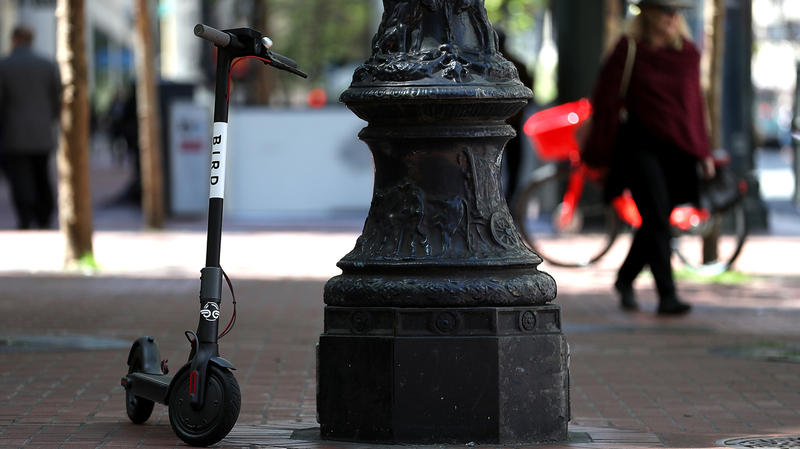 In response to the backlash, the scooter rental service Bird released a set of tools to help cities deal with the influx of scooters, which includes a tracking system that studies how people are using the scooters. "The cities we serve are Bird's number-one customer, and partnering with them to deliver the data, insights, and products they need to advance their mobility programs and reduce congestion in their communities is essential," said Travis VanderZanden, CEO and founder of Bird, in a statement. Despite the backlash, some electric scooter companies have gained incredible value in a short time. Bird doubled its value to $2 billion in just four months, and Lime was worth more than $1.1 billion about a year and a half after it launched. Investors are also playing catch-up. In July, Uber announced a partnership with Lime to add scooters to its app. Lyft recently acquired Motivate, the largest bike-sharing company in the U.S.
"I believe a lot of people were caught off guard," Clewlow says. "So not just cities, but I think that there are actually plenty of people within the private sector, in the investor community, who missed the scooter wave in terms of investment."